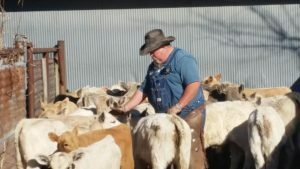 Sedan – Travis Lee Kirchner, age 45, of rural Pawhuska, Oklahoma passed away Wednesday, April 3, 2019 at his home. Travis Lee Kirchner was almost born on March 6, 1974 but waited until 12:03 a.m. on March 7 to make his appearance into this world at Sedan, Kansas. He was welcomed by his parents, Joe and Jan (Brownlee) Kirchner and big sister Jody. Travis went to school at Bowring Elementary School where his family became a little larger with the support he got from his teachers and staff. Bowring School truly represents the philosophy of “It takes a village.” He later attended school at Copan High School and moved on to Pawhuska High School from which he graduated. The next step was Tulsa Welding School where he earned his certification as a pipeline welder. Travis welded all over the U.S. for about 20 years. He also worked alongside of his dad Joe, Grandpa “Big Boy”, and uncle Bob on the family ranch in northern Osage County. He learned everything about farming and ranching from some of the best people around. He also did cowboy day work for the Rocking Chair and Strom Ranches. He also did creative “Horseshoe” art and built furniture for his friends and family. He was good at any kind of work that was asked of him. He was also very involved in the Boulanger Volunteer Fire Department. He is survived by his wife of 9 years LeeAnn who he loved with all of his heart. He is also survived by his step-son Robert and friend Lacee and his step-grandson Aiken who was learning how to drive a tractor (though he is only 2) from his “Papa T.” Other survivors include his parents, Joe and Jan, his sister Jody and husband Paul Buckner and many aunts, uncles, and cousins. He was preceded in death by his beloved Grandparents, “Big Boy” and Gertrude Kirchner and Glen and Mary Brownlee and his son Ty Kirchner. A Celebration of Travis’s Life is planned on Saturday, April 13, 2019 at the Bowring School at 10:30 a.m. with burial to follow at the Pawhuska Cemetery. Everyone who knew Travis is invited to join the family for breakfast or coffee at the school beginning at 9:00 a.m. before the funeral. In lieu of flowers the family ask that you donate to the charity of your choice. My heart aches for Leanne, Jan and Joe as well as other family members. There are no words that can give you comfort or understanding, but please know you are thought of, praying for you , and alot of people care for each of you. May your heart's heal. So sorry for your heartache and loss. Many  being said for your family. So sorry to hear about Travis. We send prayers and hugs to all. Joe and Jan, I am praying that somehow you will find peace and know that God is in control of all this. I know your hearts are breaking now. I’m so sorry. I love you both and praying hard for the whole family. Prayers for the family. Travis was a good friend. I don’t know what to say. I will miss him and my grand daughter thought he was the best deer hunter. God bless you all. You all are in my thoughts and prayers. I am sorry I am unable to attend the services and I can’t imagine the pain you are going through. Praying for peace and comfort cousins. God bless you.